The commander of Canada's largest air force base has been charged with the murder of two women and the sexual assault of two others, police said. Col Russell Williams, 46, appeared in court a day after his arrest. He was held in custody and will appear again by video on 18 February. One woman was found dead in her house in November and the other was reported missing 11 days ago. Col Williams oversaw logistical support for missions to Haiti and Afghanistan. He was appointed commander of Base Trenton in Ontario - Canada's busiest air force hub - in July. Det Insp Chris Nicholas, of Ontario Provincial Police, said Col Williams was arrested on Sunday. He was charged with the first-degree murder of Jessica Lloyd, 27, a resident of Belleville, Ontario. She was reported missing on 28 January and her body was found on Monday, police said. He was also charged with the murder of Marie Comeau, a 38-year-old corporal found dead in November at her home in Brighton, Ontario. Authorities began investigating him after police canvassed motorists for information on 4 February. They linked the two murders to one suspect on the basis of similarities between the cases, and did not expect to make any more arrests, police said. Col Williams was also charged with forcible confinement, breaking and entering and sexual assault dating from September 2009. Police were continuing to investigate his past. "We are certainly tracking the movements of where this man has been over the past several years and we're continuing with our investigation," Det Insp Nicholas said. The Chief of the Air Staff, Lt Gen Andre Deschamps, said an interim commander would be appointed, pending the outcome of the trial. 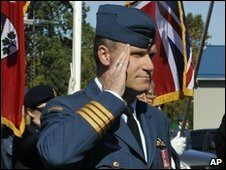 A biography on the Canadian Air Force website said Col Williams had enrolled in the Canadian Air Force in 1987 and gained his wings in 1990.